The Timor Pony was developed on Timor Island, likely from Indian breeds of horses and ponies that were imported to the island. 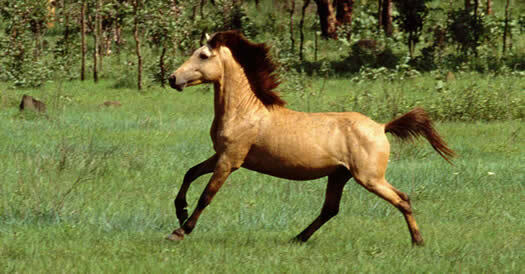 The Timor Pony is thought to be closely related to the Flores Pony, which was developed on nearby Flores Island. Both breeds are used by the local people for cattle work, as well as riding, driving, and light farm work. Many of these ponies have been exported to Australia, where they have had an influence on the breeding of the Australian Pony. Timor Ponies are strong, frugal, and agile, and have a quiet and willing temperament. The ponies have a narrow frame, short back, muscular neck, prominent withers, and a sloping croup. The shoulders tend to be straight, but the legs and feet are strong. The ponies usually stand 10 to 12 hands high (40 to 48 inches (102 to 122 cm)), and are usually brown, black, and bay, but a few are gray. The Flores Pony is usually around 12.1 hh and the dominant colors are bay and chestnut. In addition to the Timor pony, there are eight other breeds native to the islands that make up Indonesia: the Batak Pony, Gayoe, Deli pony, Bali Pony, Java Pony, and three breeds so closely related that there is debate over whether they are one, two or three, the "Sumba and Sumbawa Pony" and the closely related Sandalwood Pony. The Timor Pony is referenced in the poem, "The Man from Snowy River," by Banjo Paterson, first published in 1890.
aces de chevaux et d'équidés Lexique du cheval!